Many of us spend a lot of time inside our own minds worrying about the future, replaying events from the past, dwelling on who said what to us and generally focusing on the parts of life that leave us dissatisfied and morose. Negative thoughts, emotions and reactions come with such intensity that we get embroiled in them. It is a given fact that disagreements will flare up in any close relationship. However, when a seemingly simple exchange of words or disagreement is not within our emotional bounds, the trouble begins. When this happens, we tend to dominate the conversation with the attitude that I am right, rant and bring up hurtful things, dig up the past, etc. This leads to resentment and further arguments, and the other person shuts down. Such reactions end up making us feel raw and no one wants to admit they could be wrong. When we have a reaction (expressed or unexpressed) we feel absolutely justified in our behaviour and we always feel that the other person is at fault. There is no room for introspection. However, how have you felt after having an argument like this? The truth is that when we get angry, we end up feeling the most pain and instability. We feel drained, fatigued and we end up in a fight-or-flight response. Most of us struggle with how to break away from this negative pattern of the mind and to free the mind from reactions. 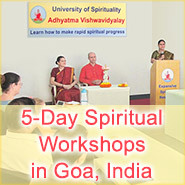 Is there a way to purify the unruly mind? Reactions are negative impulses from impressions in our subconscious minds. 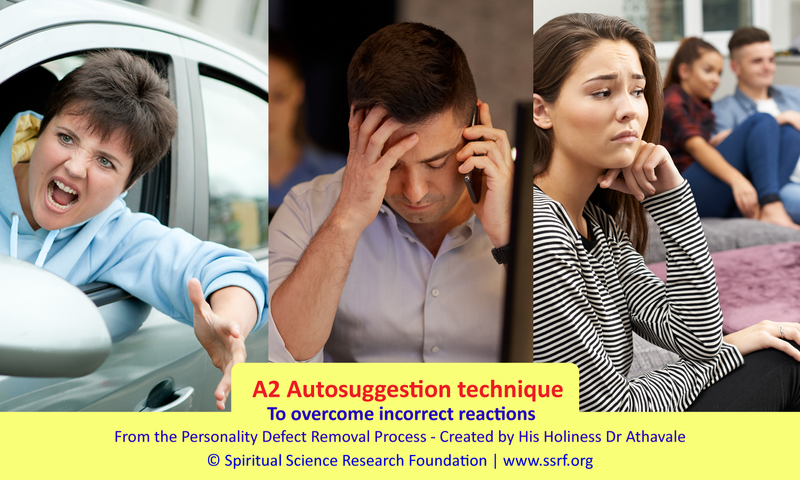 To overcome reactions there is a spiritual technique – A2 type Autosuggestions, which help to replace reactions and replace negative thinking patterns with appropriate responses. With the dedicated practice of repeating these Autosuggestions, the impressions of personality defects in the subconscious mind reduce and we experience lightness. 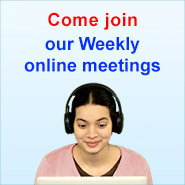 This can make a huge difference in our day-to-day happiness and comfort. Pease note : In order to understand the difference between an incorrect action and a reaction, please refer to section 4 of the article on the A1 Autosuggestion technique. 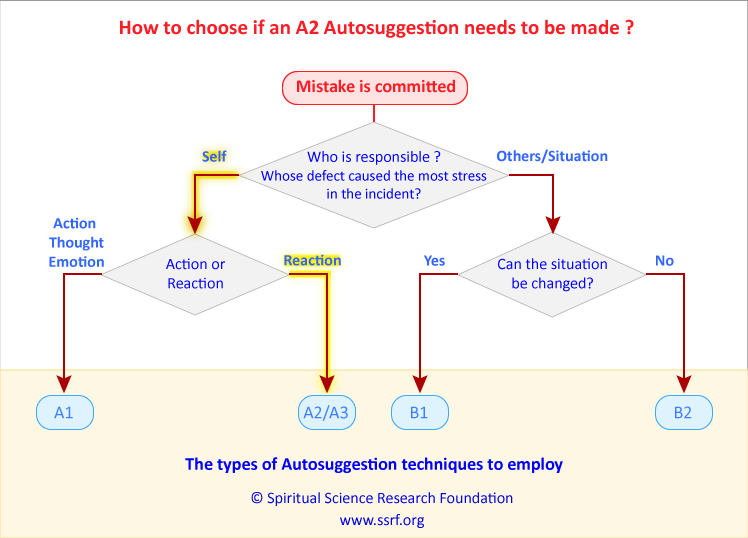 The A2 Autosuggestion technique, which is also known as the Response Substitution Technique, enables us to substitute the incorrect responses of our mind with correct responses. It helps to overcome reactions where we are primarily responsible for the mistake caused by short-lived incidents. Here, the duration of the incident provoking the reaction is important in deciding whether or not the A2 technique will be selected. The duration of the reaction is not considered. For example, if a person at work shares how we can keep the coffee mugs in a tidy manner with us and we get a reaction about it for several hours, we would still select the A2 technique, because the duration of the incident that provoked our reaction, in this case, our co-worker telling us how to keep coffee mugs in a tidy manner, is short. Use the A2 Autosuggestion to overcome incorrect reactions when the duration of the incident is short. An example is given below showing how the A2 Autosuggestion technique can be used. Example : When Rosangel was asked by her father to not go to a music concert but study, she got a reaction thinking he never lets her go to music concerts. In this mistake, the incident, or Rosangel’s father telling her to study rather than go to the music concert, lasted only a few minutes. However, Rosangel may be in reactions and not speak to her father for a day or more. Thus, the A2 technique would be used. So, in the case of the mistake mentioned above, the Autosuggestion below could be used. The Autosuggestion starts with “Whenever” and then that part of the mistake comes, which is the actual trigger (here it is Rosangel’s father telling her not to go to the music concert). Next, the realisation that Rosangel’s father is correct is developed, and then, the desired reaction is substituted (here it is for Rosangel to listen to her father and study). 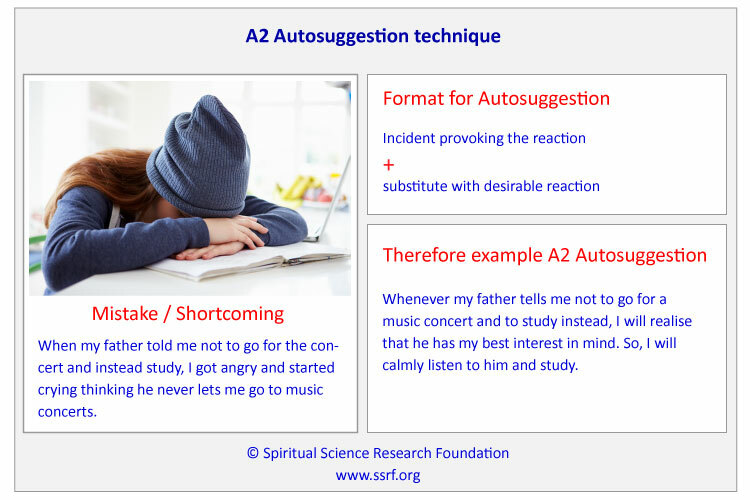 The A2 Autosuggestion technique can be used to overcome defects such as criticising others, irritability, being short-tempered, quarrelsome nature, unrepentant nature, stubbornness, suspiciousness, superiority, pride, etc. A reaction is any unpleasant response which we have towards a given situation as we are not able to accept the situation. Usually, we are used to thinking about reactions only in terms of anger. However, whenever our minds feel negative emotions towards a person in a situation or during interactions, it is also considered a reaction. Examples include feeling hurt, overemotional, jealous, prideful, etc. Incorrect thoughts, emotions or actions are a part of the reaction. They can occur in combination in a mistake or one of them may occur. For example : ‘When I reached home after a long day’s work and saw the newspapers and clothes lying on the bed, I got irritated and kept thinking of why my wife Madhu had not cared to organise the room. I am very tired, and I have to do it this late and she is busy watching television and wasting time. I spoke to her angrily about this.’ Here, thoughts, emotions and incorrect actions are a part of the mistake. Reactions can be of various types. They can be expressed or unexpressed. Examples of expressed and unexpressed reactions are given ahead. When I was stuck in a traffic jam, I was annoyed and kept reacting by shouting at other drivers and honking continually. When my husband did not give me hot steaming coffee as I like it, I had a reaction and I told him I will not have the coffee because it is lukewarm. An unexpressed reaction occurs when in a given situation we have an internal reaction and we don’t express it. We just keep it in mind and brood over it. Unexpressed reactions are more detrimental as they consume our mental energy. As we don’t express them or get a solution, they can become extreme. If unexpressed reactions are not addressed and worked upon, they can increase the impression of the personality defect in our subconscious minds. When a reaction is expressed it loses strength and the mind feels relief. One can also get a solution after expressing it. Ideally, one should express oneself not in a reactive manner, but rather from the point of finding a solution. When my friend Tia commented that the new dish I made is not so tasty, I had an internal reaction thinking she is very fussy. When the annual increment in salaries was announced at work and I heard my colleague Mark got a bigger increase in his salary than me, I had an internal reaction thinking that Mark is always flattering our boss and that is why this happened. I could never behave that way. The A2 Autosuggestion technique can be used for both expressed and unexpressed incorrect reactions where the duration of the incident is short. A visual representation showing how to know when to select the A2 technique is given ahead. Let us take the mistake below as a practical example illustrating how to know when to select the A2 technique. When Emma shared points of improvements for a project I had worked on in front of our boss, I felt angry thinking that she is trying to put me down. The first question we need to ask to determine the Autosuggestion type is – whose personality defect is primarily the cause of stress in the situation or who is responsible for the mistake. Here it is self as Emma is helping to make the project better but due to my defects, I am reacting. The next question we would ask is ‘Was this mistake an incorrect action, thought or emotion or was it an incorrect reaction ?’ Here it is a reaction to Emma. Finally, we would ask if the incident provoking the reaction is a short-lived incident. In this case, Emma would have only told my mistakes for a few minutes, so it is a short-lived incident. So, based on the analysis, an A2 Autosuggestion can be used. 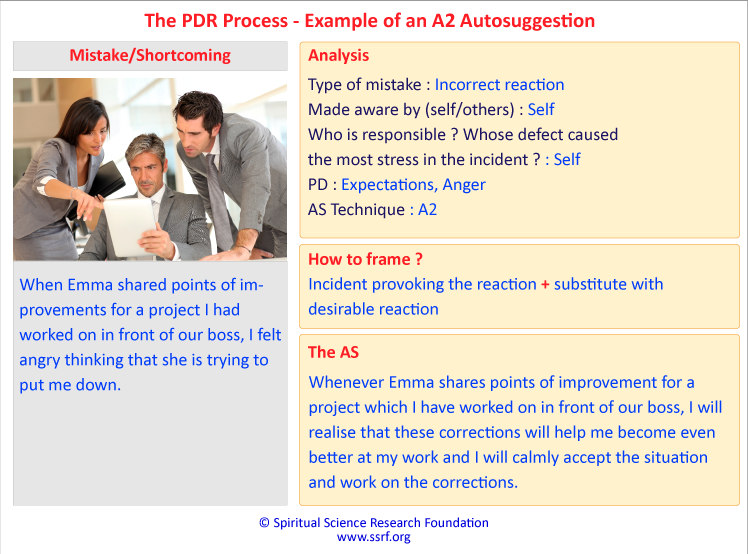 Whenever Emma shares points of improvement for a project which I have worked on in front of our boss, I will realise that these corrections will help me become even better at my work and I will calmly accept the situation and work on the corrections. The perspective can vary as per one’s constitution, personality and what appeals to the mind or is easily acceptable. Choosing an acceptable perspective helps to bring about positive changes faster. The exception to this is if awareness of the defect is not there in us, in which case mentioning the defect in the Autosuggestion helps to develop awareness. Please note, we have provided alternative Autosuggestions for each mistake. This is because for any individual as per their personality their mind may be more receptive to certain perspectives over others. A2 Self Hypnosis Autosuggestions from SSRF Inc.
At some point in one’s life, one may have faced situations similar to the examples given above. One may have also reacted adversely to such situations, giving pain to oneself and others involved. Later upon reflecting on our behaviour, we may wish we could have handled it better, but at that time, the situation brought out the worst in us. Such reactions and outbursts can have long term repercussions and may even damage relationships irreparably. While we all hope that we can learn from our mistakes, in reality, the next time the situation presents itself, unfortunately, history also repeats itself. It seems like we are in a vicious cycle, with no way out. The A2 Autosuggestion technique helps us to find a way out. It not only helps us to learn from our mistakes and identify our personality defects but also trains our minds to respond appropriately. As we continue with the PDR process and take A2 Autosuggestions, we are able to remain stable and react correctly in different incidents. Through practice, positive impressions get ingrained in our attitudes and we change for the better.